Evan Ziporyn (b. 1959, Chicago) has composed for the Silk Road Ensemble, the American Composers Orchestra, Brooklyn Rider, So Percussion, Maya Beiser, Wu Man, Sentieri Selvaggi, and Bang on a Can. He studied at Eastman, Yale & UC Berkeley with Joseph Schwantner, Martin Bresnick, & Gerard Grisey. He is Inaugural Director of MIT’s new Center for Art, Science and Technology, where he has taught since 1990. His work – informed by his 30+ year involvement with traditional gamelan. He received a Fulbright in 1987, founded Gamelan Galak Tika in 1993, and has composed a series of groundbreaking compositions for gamelan & western instruments. These include three evening-length works, 2001’s ShadowBang, 2004’s Oedipus Rex (Robert Woodruff, director), and 2009’s A House in Bali, which was featured at BAM Next Wave in October 2010. Awards include a USA Artist Fellowship, the Goddard Lieberson Prize from the American Academy, Massachusetts Cultural Council Fellowship, the MIT Gyorgy Kepes Prize, and commissions from Carnegie Hall, Kronos Quartet, Rockefeller Multi-Arts Program, and Meet the Composer. He co-founded the Bang on a Can All-stars in 1992, performing with the group for 20 years. 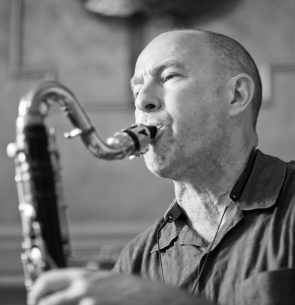 He has also recorded with Paul Simon, Steve Reich Ensemble (sharing in their 1998 Grammy), and Matthew Shipp, and he currently performs with Iva Bittova and Gyan Riley as the Eviyan Trio.